“FRAMOS would like formally thank all customers, prospects and peers for visiting our booth at the 2018 Vision Show in Stuttgart. We hope your conversations with our FRAMOS’ team of experts were informative, helpful and a great guidance. We would like to further extend our appreciation to those who took the time to attend one of our live demonstrations, the VDMA panel discussion on the future of vision or our Market Study presentation”, said Dr. Andreas Franz, FRAMOS CEO. At their booth, in the heart of Hall 1, the FRAMOS experts educated current and potential vision users about the latest advances in Embedded Vision, 3D technology and Machine Vision, providing practical solutions to industry-specific challenges. One of the biggest highlights at the booth was the launch of FRAMOS’ first, internally developed, product ecosystem that enables customers to create Embedded Vision devices using a modular approach, enabling them to enter into the next era of innovative products. “This was a very great Vision Show to us”, expressed Chris Barrett, Vice President Engineering. “Our very first product line that easily enables Embedded Vision development received exciting feedback across the industry. We are very proud to support our customers with our line of sensor modules and adaptors that we have created within our ecosystem, helping them get to the market faster and with reduced risk”. 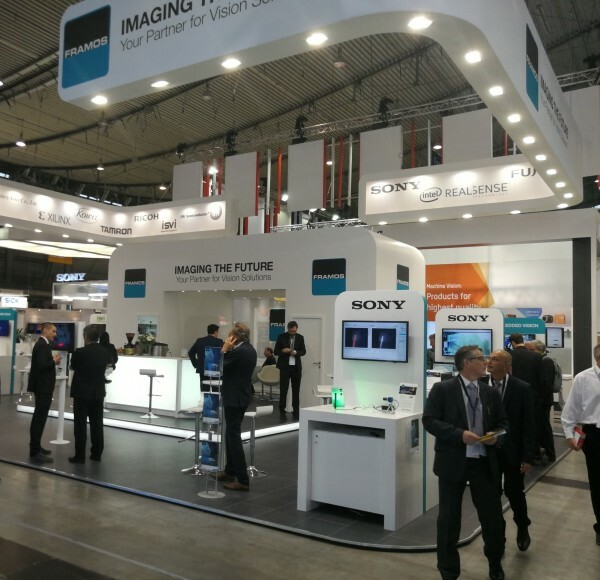 Sony’s new on-chip polarization sensor IMX250MXR plus the ON Semiconductor XGS family and X-Class platform were highlights for images sensors that were a draw for people at the show due to their excellent image quality and high-speed live demonstrations. Many were also very interested in the different applications showcasing the Intel®’s RealSense™ Technology for gesture recognition and 3D tracking. ISVI presented their new Razor camera line and the prototype of a super-precise 3D device that both attracted enormous attention to those who walked by. The Pyxalis team showcased how to create custom sensors and semi-custom solutions to meet special sensor requirements to round of the booth highlights. With 37 years of vision experience, FRAMOS supports industrial customers, OEMs, System Integrators and researchers overcome challenges enabling machines to see. Whether it is about selecting individual components or complex system compositions, FRAMOS serves clients with a broad range of components and modularity of designs. Vision solutions can be developed very quickly to help innovative embedded products to get to market faster.